As cats age, even with years of loving care, they may begin to experience elderly cat health problems. Cats are considered seniors once they reach 10 years old, and as a result of both an improvement in veterinary care and cat owner’s dedication there are many Cat's that live into their late teens, early twenties. The most common elderly cat health problems are cancer, dental disease, hyperthyroidism, kidney disease, inflammatory bowel disease, obesity, heart disease, diabetes and arthritis. Cancer is the number one elderly cat health problem that causes death in older cat. Symptoms include difficulty breathing, difficulty eating, loss of appetite, weight loss, o abnormal swelling, and sores that don't heal. Treatment varies depending on the location of the tumors and the type of cancer. A biopsy is needed to confirm and determine the type of cancer. Treatment usually includes chemotherapy or radiation therapy. Surgery is also a option for older cats, but some veterinarians may recommend against it if the cat is too weak. Dental disease, also called periodontal disease, is another highly common elderly cat health problem. Dental disease doesn’t just affect the cat’s teeth and gums, but the stress of the illness and a possible infection affects the entire body. Symptoms include weight loss, drooling, difficulty eating, and bad breath.To find out more on how to preventdental health problems in cat read Cat Dental Health Problems and How To Prevent Them. Treatment includes a professional dental cleaning that is completed by your veterinarian. During the cleaning, which requires anaesthesia, your vet will remove tartar and plaque off of your cat’s teeth. If needed your vet will also extract any teeth that have decayed or are infected. It is also important to regularly check your cat’s teeth and gums and to brush them or use a commercial product to prevent and remove tartar. Hyperthyroidism is a condition where the thyroid glands produce too much thyroxine, a type of hormones. The overproduction of this hormone causes your cat's metabolic rate to significantly increase past a healthy level. Symptoms include increased heart rate, laboured breathing, weight loss, increased appetite and activity, as well as increased thirst and urination. Treatment can involve medication that prevents excessive thyroid hormone production, radioiodine therapy that kills the excessive thyroid cells, or surgery to remove the diseased portions of the cat's thyroid glands. Kidney disease is an elderly cat health problem that is progressive and incurable. As the disease progresses, the healthy kidney cells deteriorate and are replaced by scar tissue. Warning signs include weight loss, excessive thirst and urination, dull coat, difficulty urinating, and loss of appetite. Treatment may include a strict diet regime low in protein, supplemental fluids, potassium supplementation, and medication to minimize anemia and to prevent further damage to the kidneys. To find out more about how kidney disease affect cats and different treatment options read Symptoms And Treatments Of Feline Kidney Disease. Inflammatory bowel disease is a group of disorders caused by white blood cells in the mucosa of the gastrointestinal tract. Symptoms can include vomiting, diarrhea, dehydration, lethargy and weight loss. In order to treat the disease, your vet will have to diagnose the cause and then work on treating it. Treatment could consist of a low-fat, easily digestible diet or a high fibre diet depending on if the colon is affected or not. Medications may also be used to treat this illness. Heart disease in cats is a elderly cat health problem that is caused most often by Cardiomyopathy, which means that the muscle of the heart begins to work improperly. It's a progressive and typically hereditary disease that may eventually lead to heart failure. Cats suffering from heart disease do not usually show symptoms; however some symptoms include difficulty breathing, lethargy, decreased appetite, weight loss, coughing and weakness. Treatment includes medication to improve heart function and eliminating stress from the cat's environment. Feline obesity is an elderly cat health problem that tends to affect a vast majority of senior cats due to a combination of low activity levels and overeating. Symptoms include tangled/matted cat, difficulty climbing, running or jumping, difficulty grooming and lethargic. Treatment may include increasing your elderly cat's activity level, changing their diet, decreasing treats and decreasing your cat's overall calorie intake. Feline arthritis is known as inflammation of the joints, but it can affect other parts of your cat's body depending on the specific type of arthritis. Arthritis caused by calicivirus and bacterial arthritis all affect a cat's mobility and causes an elderly, slow-moving cat even more trouble getting around. Symptoms of this condition include urinating or defecating outside of the litter box, irritability, difficulty jumping or climbing stairs, and limping and stiffness. If left untreated, arthritis can eventually lead to complete immobility. Treatment includes dietary supplements, fish oils with omega-3 fatty acids and other alternative methods like acupuncture and acupressure. Diabetes is a manageable condition for most cats, it is caused by the inadequate production of insulin by the pancreas or the cell's inadequate response to insulin. Symptoms include an increase in urination and thirst, and rapid weight loss. Treatment may include insulin therapy and a special diet.To find out more about symptoms to be aware of and trearment options of diabetes in cats read Symptoms And Treatments Of Diabetes In Cats. 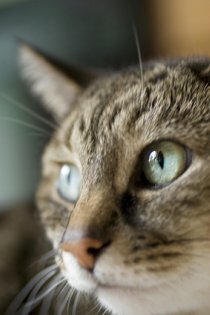 Eye Problems is a common elderly cat health problem. As your cat gets older their usually excellent vision may start to deteriorate. Your vet will need to carefully examine your cat’s eyes eye in order to determine out of the 21 different eye ailments which one your cat may be suffering from. Some of these conditions include cataracts, dry eye, glaucoma, bacterial eye infection and the most common, conjunctivitis. Untreated eye problems can cause blindness in cats if left untreated. Symptoms can include watery eyes, eye discharge, cloudy eyes, bulging or sunken eyes, pawing at the eyes, or abnormal eye movements. Depending on the type of illness, eye conditions can be treated with antibiotics or surgery. As owners of a healthy senior cat, we have had to make changes over the years to accommodate or aging cat as she entered and lives through her golden years. As cats age they begin to slow now, and may experience difficulty jumping, running and climbing. It's important to make sure that their litter box, food and water aren’t in a location where they have to climb too many stairs or jump, like some of those designer cat litter boxes require. Another elderly cat health problems that we noticed that our senior cat developed was the deterioration of her vision, which made it difficult for her to see when all the lights were off at nights. To help her see better when she is using the litter, eating or drinking at night, we bought night lights and plugged them in. Although senior cat's may not be as interested in play as they were as kittens, playing still helps to keep their bodies healthy and lean. We have simply shorten the play times and play with toys that do not require jumping, just a bit of chasing, once she is tired she indicates this by laying down. It is also very important to have a regular dental hygiene routine with your senior cat, they have an increase chance of having tartar and plaque build up due to their age. If your cat won't allow you to brush their teeth, which some cats simply won't, then there are commercial products such as gels and liquid that helps to remove plaque and tartar build up without brushing. Annually take your senior cat, or cats at any stage of life, to the vets for their check up, sometimes the vet catches health problems that we miss, and it is always better to find out a elderly cat health problem in the early stages. How To Treat And Prevent Worms In Cats - Discussing worms in cats treatment and prevention. Feline Herpes Virus: Causes, Symptoms, Treatments - Discussing the causes, symptoms and treatments of feline herpes virus. Feline Ear Mites: Causes, Symptoms, Treatments - Ear mites can be very uncomfortable to your cat, learn about the symptoms to be aware of and different treatment options. Feline Constipation: Causes, Symptoms And Treatment Options -Feline constipation can be both uncomfortable and painful for your cats, read to find out causes, symptoms and different treatment options.